You love to video tape or photograph your self but always struggle to find something to prop up your phone at the right angle, we have the best solution. Kick it is a self photography accessory that gives you 8 Angles to choose from so you can capturing the perfect picture or video. 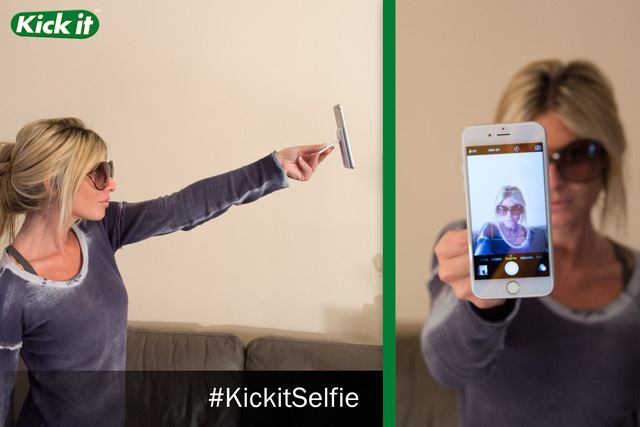 Kick it is a self photography accessory for your cellphone that can be used as a mini selfie stick or for completely hands free photography. 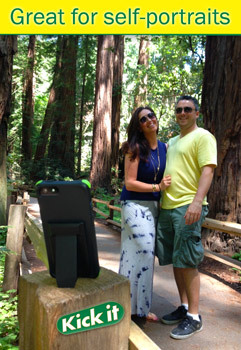 Pictures below illustrate the many different ways you can use Kick it as a stand, mount and wedge gadget to to capture the perfect picture at the perfect angle. Pictures and videos below, see why kick it is such an important part of the self photography revolution. No more asking if someone can take a picture for you, Kick it acts as a mono pod to stand your phone at the desired angle to capture the perfect photo. Just use the self timer feature in your phone to auto snap the pic. You can also use your iPhone watch to snap a pic from a distance.